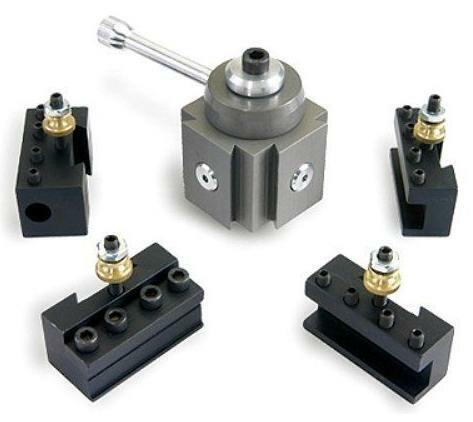 This is a review of a very inexpensive Quick Change Tool Post (QCTP) set for 7x mini-lathes that can be purchased on Ebay for about $38 (including shipping). It is considerably less expensive than similar size QCTPs that you can find on LittleMachineShop.com and Amazon that cost about $135 to $155 plus shipping. I purchased it because the cut-off blade holder for my 10-year old A2Z CNC QCTP had broken and I needed another one ASAP. I didn’t have time to fix it and I couldn’t buy a replacement because the company has gone out of business. My set was on loan to the SparX 1126 FIRST Robotics Team, where I am a mentor, and it was getting heavy use because we were in the middle of the build season. So, when I came across this cheap QCTP set on eBay I decided to take a chance and buy it for the team. The same set is sold by many eBay vendors and I chose this one and paid a higher price, $45, because they were promising delivery sooner than most other vendors and the seller has a high rating. It was delivered six days after I ordered it. It’s manufactured in China and it comes with four tool holders – two identical holders for turning and facing bits, a ⅜-inch boring bar holder and a holder for ½-inch cut-off blades. The tool post is made almost entirely from hard anodized aluminum and the tool holders are made of steel. In comparison, the $135 QCTP that Little Machine Shop sells for 7x lathes is made entirely of steel and it includes an additional holder that can knurl in addition to hold another tool bit. I think the extra mass, strength, and rigidity that comes with steel construction is very desirable. However, I’m not sure you’ll notice much of a difference on small lightweight lathes likes the 7x. So don’t automatically pass on this cheap Chinese QCTP unless cost is not a consideration or you’re using your lathe for production or something that regularly pushes its limits. My A2Z QCTP set, which I’ve been very happy with, is also made of hard anodized aluminum but it was obviously made with much more care than the one I just bought. The fit and finish of the new tool holders is very good. But the tool post parts have tooling marks, a rough “matte” finish and nicks on the edges and corners that show it wasn’t handled with much care after it was machined. And that makes me wonder if the tool post is really hard anodized like they claim it is. In addition to the tool post and four tool holders, the set included two steel bolts (M10 & M8) for mounting the post to a lathe and a couple of Allen wrenches. 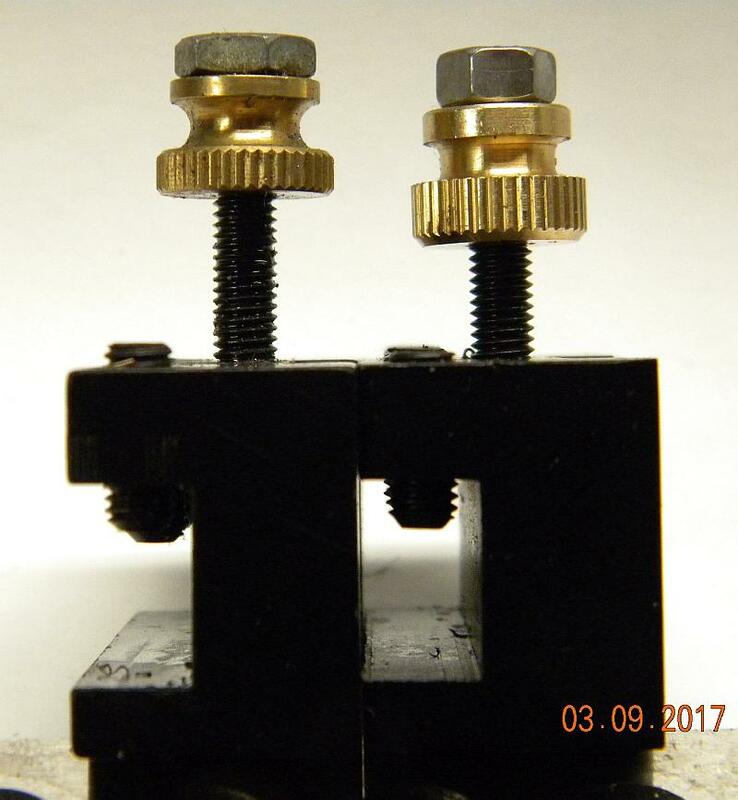 The larger bolts are obviously for mounting the post to the typical 7×10, 7×12 or 7×14 Chinese made mini-lathe sold by Harbor Freight, Grizzly, LittleMachineShop and many others. I’m guessing that the smaller bolt is probably for mounting it on other lathes. But you’re not going to be able to use it unless you make a bushing so the smaller bolt will fit the center hole of the tool post. This cheap QCTP is almost identical to A2Z’s design in both size and looks and so it’s probably a copy. I suspect the small differences in size are are due to the use of metric size tooling, measurement errors and/or production methods. If you’re wondering, the Chinese toolholders won’t fit on my A2Z tool post because the dovetails are just a little too small. One problem with this quick change tool post is that the dovetails don’t fit as closely as they should, like they do on the American made A2Z tool post. The pistons will still tightly lock the tool holders and so I don’t think this is a big deal. But it’s a stupid thing that would cost nothing to fix and it would eliminate what is likely to be a common complaint about this product. There’s another flaw that will affect you if you use ⅜-inch tool bits or carbide insert holders. You’ll probably find you can’t lower the tool holder enough to put the cutting edge on the center unless you remove the holder’s stop nut. That’s because the headless screws are a little shorter than they are on my A2Z holders and the brass adjusting nuts and lock nuts are thicker. The following picture shows the difference between my A2Z holder, which is on the left, and this cheap knock off. I looked and couldn’t find longer 4mm headless screws (with hex sockets). So if you need to make the holders more adjustable then I suggest replacing the existing screws with socket head cap screws. You may also be able to fix the problem by facing the nuts on the lathe to reduce their height. I also found that every 4mm nut in my collection is thinner than the ones that came with this set. This tool post seems to work well but it hasn’t seen any heavy or long-term use yet. I think you’ll be OK if you buy one and don’t mind making some modifications if you need more height adjustment. However, you will be taking a small gamble and if you really can’t afford to waste $40 then wait until there are more reviews and a clear consensus about these QCTPs. 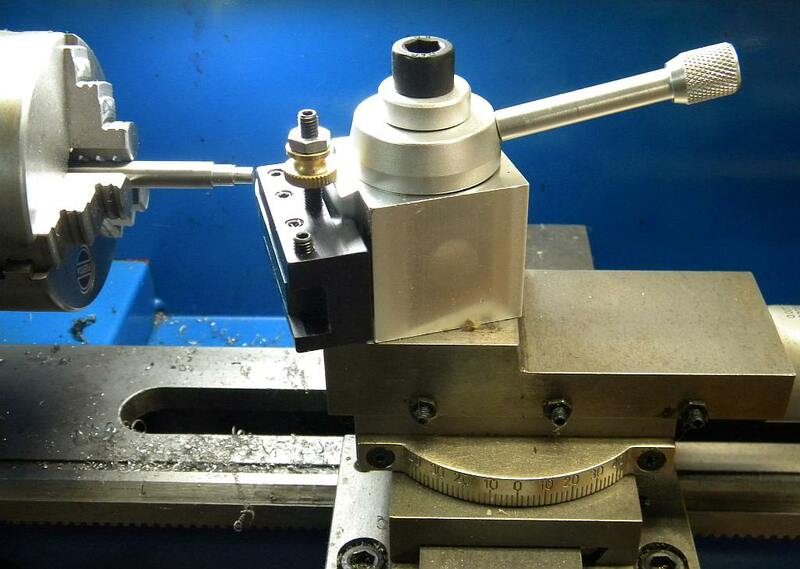 The lantern style tool holder that comes with most mini-lathes fits into a little stud in the compound rest that prevents cutting forces from turning it. Any QCTP that you buy won’t have the notches needed to use it. So you’ll need to remove the stud (easy) and replace it with a “washer” cut from a plain piece of paper. Believe it or not it that will be enough to prevent the post from turning. Without it the tool post will probably rotate no matter how much you tighten the mounting bolt. At least that’s what I remember from about nine years ago. I stumbled across a more expensive QCTP that looks, from the picture, like much better and more exact copy of A2Z’s product. They cost about $70 with shipping and you can find them by searching eBay for “HHIP 3900-5350 Mini Aluminum Quick Change Tool Post.” HHIP is a company that sells a large variety of industrial quality machine tools and it look likes they’re good quality. I’d like to hear your opinion if you have one of the quick change tool posts and I’m sure many others would too. It’s easy to leave comments here because you don’t have to create an account. Nice review, Rob. It’s good to see you posting. Can the dovetails on the chinese tool holders be opened up so that they will fit the one that littlemachineshop used to sell? Very little material would need to be removed but I wouldn’t want to do it without a dovetail cutter. It looks like a pretty precision fixture. Do you think maybe it’s built of a less durable stock though. I remember it being said; “you get what you pay for”. I bought one and soon consigned it to file 13. I too, wasted my thirty quid as I had half expected to do, on an EBay purchase. The kit is in a box as the aluminium might come in handy!